Please refer to our stock # SR4418 when inquiring. 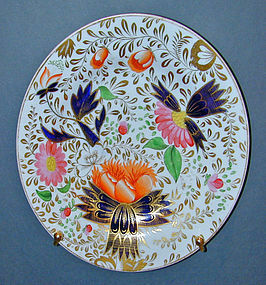 Beautiful porcelain dinner size plate (9 3/4" diam) from Chamberlain's Worcester Factory with a stylized Bow pattern. Rarely is early 19th Century English porcelain marked. We guarantee that it is Chamberlain's Worcester. Beautiful condition, no repairs.